Today we saw the monsoons of monsoon season. It was a welcome sight to the people of Jaipur who before today were in a significant water crisis. Despite the weather, Wes and I quite possibly had our most memorable day in India so far. I was a little unsure of our new guide Sanjay this morning because he was a little older than our other two guides and he only seemed to talk to Wes, but as the day progressed he loosened up and realized that I was the cool one and from then on I had his undivided attention:) Our first stop was the Amber Fort where we had our elephant ride. Elephant rides aren't supposed to be terrifying but this one was because we were on a very skinny windy road up a gigantic hill and with every step our monster elephant sent our little passenger cage very close to the edge. 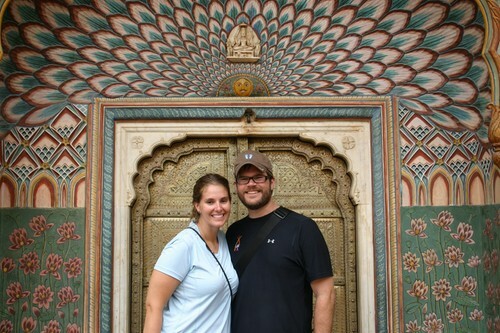 Unlike many of the sights we have seen so far in India, the Amber Fort was in very good condition. With other monuments, we often had to visualize what precious gems or elaborate paintings used to be decorate the walls, but in the Amber fort many of the original paintings or glass inlays were in great condition. After the Amber Fort we were off to the observatory or Jantar Mantar where a king of Jaipur, Sawai Jai Singh, constructed scientific instruments to show his people how to accurately find the time, predict the weather, and understand the sky in a simple way. Across the street was the City Palace where the current royal family of Jaipur resides. Part of the Palace is open to the public and has been converted into a museum. The rain finally stopped when we entered the city palace and we could enjoy all of the rich colors and sights. After sight seeing we enjoyed a great lunch with Sanjay and really got to know him. We talked all about arranged marriages, politics, and the strengths and weaknesses of both of our governments. It was a very memorable lunch that meant a great deal to us all.